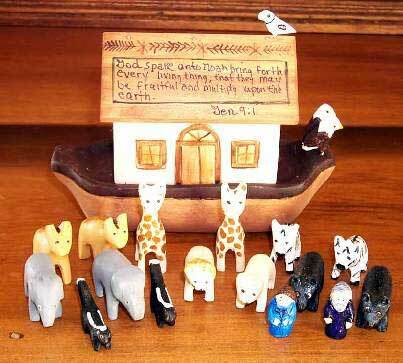 This carved Noah's Ark includes a detailed boat and ramp with a painted scripture verse on the roof. 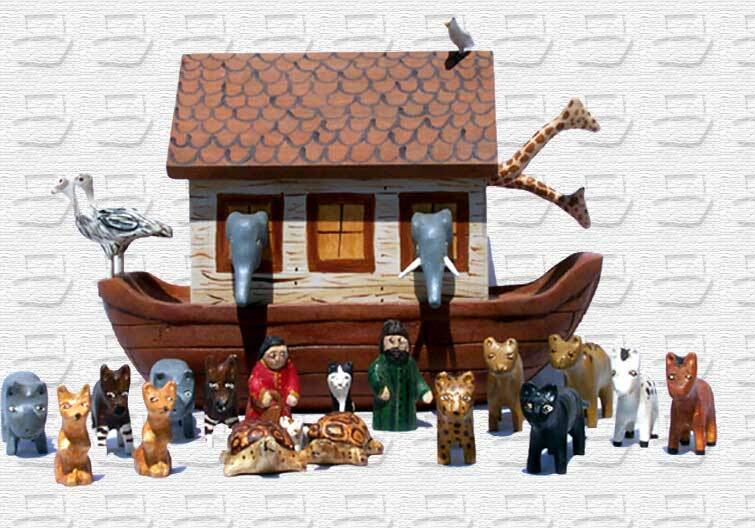 The set includes: Noah, Mrs. Noah, a dove, elephants, giraffes, leopards, snakes, polar bears, tapirs, frogs, pheasants, armadillos, gazelles, apes, seals, dogs and cats. This ark features a combed boat with a grained roof and detailed white house. 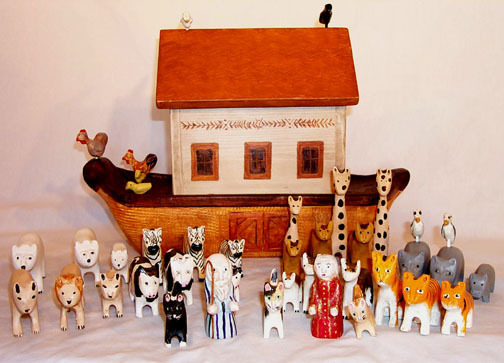 The set of animals includes: Noah and his wife, a dove, a raven and pairs of hippos, giraffes, tigers, camels, chickens, zebras, llamas, polar bears, lions, cats, and their offspring. 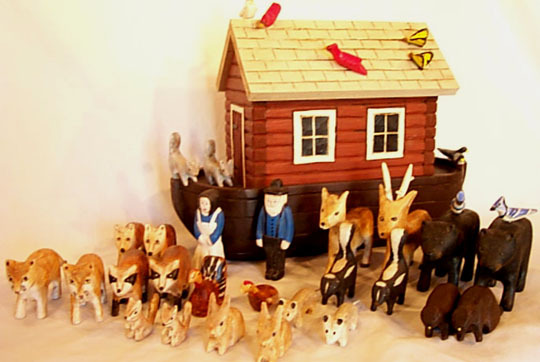 This ark features a brown boat, brick-red log cabin and cream shingled roof. The set includes Noah and his wife, a dove, and pairs of: blue jays, cardinals, woodpeckers, robins, butterflies, bears, raccoons, beavers, foxes, squirrels, deer, skunks, rabbits, chipmunks and opossums. This ark features a carved boat with detailed roof and house. This set includes Noah and his wife, and pairs of camels, rhinoceros, ostriches, okapis, cats, horses, giraffes, kangaroos, leopards, elephants, tortoises, and a dove. God called on Noah, his wife, three sons and their wives to build an ark. This ark features doors that open where monkeys hang. Through the open windows you see giraffes, zebras, camels, Noah and Mrs. Noah. 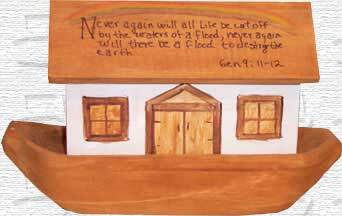 The hand painted scripture verse was taken from Genesis 7:13-16. 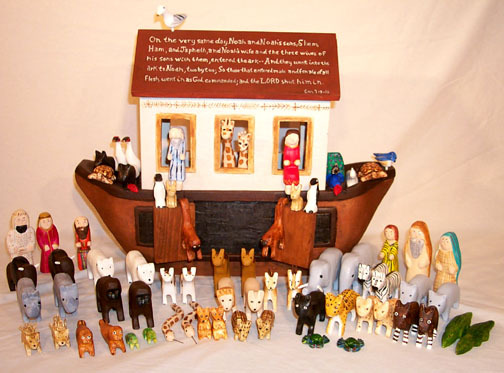 The ark includes a total of 65 animals and Noah's eight family members. 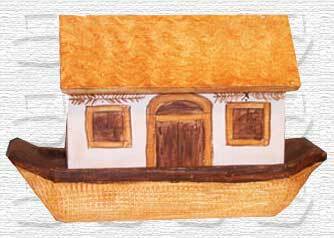 This mini ark features a carved boat, detailed house with a scripture painted on the roof. Genesis 9:1 is the scripture verse selected for this ark. This set includes Noah, his wife, a dove, and pairs of lions, giraffes, zebras, eagles, bears, skunks, camels, and elephants.